About Us - Welcome to Little Diva Bowtique, LLC! Home of the $5 Make Your Own Headband/Hat Site! Little Diva Bowtique is located in Kiel, Wisconsin began in May of 2010 as a hobby out of my home in honor of my "little diva" who will be three in June. My goal is to create that special look for every diva in your life without spending a fortune. My website is just a sampling of what Little Diva Bowtique, LLC has available. Take your time to browse our website and enjoy! Little Diva Bowtique is now are linked with PAYPAL to help you place an order online! All shipping costs will be on an individual basis according to your order and where you live including any paypal costs. We only ship within the states and Canada. 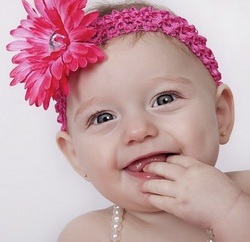 Hair accessories may contain small parts and not suitable for children under age 3. Returns are only accepted within 7 days of purchase on unworn accessories. Please email Little Diva Bowtique at littledivabowtiquellc@yahoo.com to inquire about any of the products, place an order, or to set up a time to come and take a peek! Discounts are given on bulk orders. We'd love to see your pictures and hear your comments!